Mercedes-Benz has launched yet another addition to its AMG range in India. The SLC43 is the spiritual successor to the SLK55 AMG and has been priced at Rs 77.5 lakh (ex-showroom, Delhi). 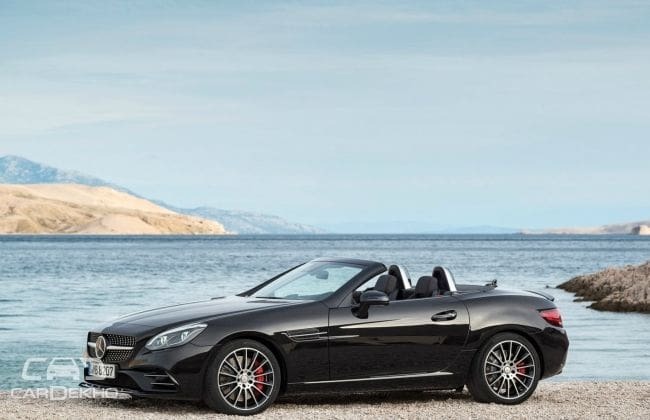 It is essentially a facelift to shift the roadster into Mercedes-Benz’s new nomenclature, but features a new engine among other changes. Trivia: The SLK55 AMG was launched at Rs 1.26 crore (ex-showroom, Delhi) when it was introduced in 2013, making the SLC43 quite a bit more affordable! Built in Affalterbach, the 2-door is the first AMG product to feature the ‘43’ badge and is the ‘gateway model’ into AMG’s roadster range. Following the trend of downsizing seen across the German automaker’s range, the SLC43 drops the old 5.5-litre V8 engine in favour of a 3.0-litre biturbo V6 engine with an AMG-specific engine management system. The output figures are delicious as ever, with a peak power output of 367PS and maximum torque of 520Nm. The oomph is driven to the rear wheels through a ‘9G-TRONIC’ 9-speed automatic gearbox with paddle shifters. 0-100kmph comes up in a claimed 4.7 seconds with the top speed electronically limited to 250kmph. For improved handling and stability, the SLC43 gets a steel suspension that has been optimised to reduce body roll. You also get the AMG ‘Dynamic Select’ function, which enables the driver to alter the suspension’s behaviour, based on the driving scenario. Also offered is a ‘handling package’, which gives you a mechanical limited-slip differential for the rear axle. The AMG SLC43 gets a new front bumper with large air intakes, a muscular bonnet, 18-inch light alloy wheels and a new rear bumper with integrated tailpipes. On the inside, it gets a flat-bottomed, multi-function steering wheel draped in nappa leather, AMG nappa leather/Dinamica microfiber upholstery for the sports seats, and the AMG instrument cluster that sports a 4.5-inch multi-information display and a race-timer. For entertainment, the car is offered with a 7-inch infotainment system that supports Bluetooth connectivity, a DVD player, internet radio and the ‘Linguatronic’ voice command system. AMG’s range in India will now include the SLC43, CLA45, GLA45, C63 S, E63, S63, S63 Coupe, G63, GL63 and the AMG GT S.